BBay Running welcomes contributions to reuse or recycle your used running and walking shoes. By saving them from landfill for reuse or recycling, we help less fortunate youth and adults while improving our environment by reducing our carbon footprint. For reuse, our primary goal is to give shoes an extended life in our local community for both youth and adults. After local organizations have selected through your donated shoes, we ship the remaining reusable shoes to MORE Foundation. The proceeds from the shoes help MORE plant thousands of trees each year, which offsets carbon in the atmosphere. Non-reusable shoes get recycled. Northwest Youth Services – NWYS collaborates with at-risk, runaway and homeless youth to foster self-reliance. Growing Alliances – A major goal of Growing Alliances is to decrease the number of youth transitioning out of foster care and into unemployment, incarceration and homelessness by providing paths towards financial stability through vocational and educational opportunities in urban agriculture. Lighthouse Mission Ministries – The Mission works to break the cycle of homelessness in the lives of people experiencing it through vital services such as nutritious meals, safe shelter and one-on-one case management. Opportunity Council’s Whatcom Homeless Service Center – Our mission is to build relationships to end homelessness through advocacy, systems change, and strategic partnerships. Ferndale Community Resource Center – A place where everyone is welcomed by knowledgeable staff who connect people with resources and to share skills and talents with one another. Opportunity Council’s East Whatcom Regional Resource Center – Our mission is to help people improve their lives through education, support and direct assistance while advocating for just and equitable communities. Catholic Community Services – CSS provides a continuum of care for homeless and low-income people. Through day centers, emergency shelters and emergency services, we provide warm, safe refuge from the streets. After donation to local organizations is exhausted, reusable shoes are shipped to MORE Foundation, an organization that leverages used athletic shoes to fight poverty, hunger and global warming. Shoes that do not qualify for reuse are set aside for recycling. 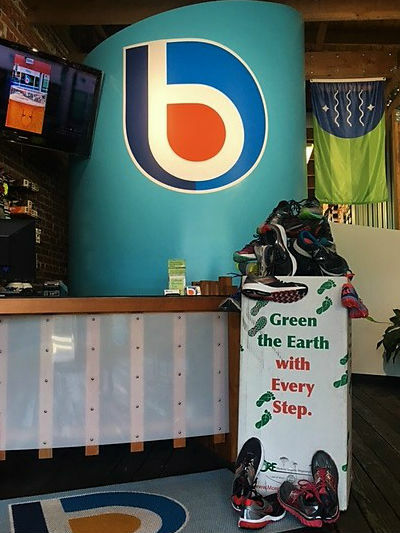 BBay Running takes non-reusable shoes to Nike Clearance Store in Burlington WA for recycling. Nike collects old, worn-out athletic shoes for recycling, and along with pre-consumer shoe waste, transforms them into Nike Grind, a material used to create athletic and playground surfaces and more. Please bring your gently used athletic shoes to BBay Running for drop-off or to any races with whom we partner, including GBRC, for shoe recycling. Since 2013, BBay Running doing right for second-life and end-of-life of running and walking shoes while being kind to our environment. Thank you for your shoes, your help.